While Guy Fawkes was celebrated as a holiday on November 5th in England, in Boston it was known as Pope Night. The Gunpowder Plot of 5 November 1605 in England was led by a group of English Catholics who wanted to restore a Catholic king by assassinating the Protestant King James I. Guy Fawkes was arrested as part of this conspiracy. His effigy was burned in celebration for this annual celebration which is also known as Guy Fawkes Day, Bonfire Night or Fireworks Night in England. 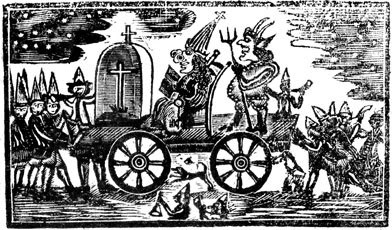 Anti-Catholic sentiment was strong in Boston (also anti-Quaker, anti-Scots Irish Presbyterians, you name it), and so the celebrations were carried over the Atlantic to Massachusetts where it became known as “Pope Night" or "Pope's Day”. Effigies of the Pope and other Catholic clergy were burned instead of images of Guy Fawkes. This is hard to believe today in 21st century Boston, where the Irish Catholic Kennedys are treated like American royalty. In the 17th century Boston was staunchly Protestant and anti-papist. These celebrations often became riots as gangs of young men competed for the honor of burning the Pope, or having the biggest bonfires. In the 1760s and 1770s this progressed toward anti-British sentiment and effigies of the King and other British politicians were burned. This was a treasonous offense. The Quebec Act of 1765 allowed Catholics in Canada and north of Ohio to practice their religion, which sparked a new interest in Pope’s Day and anti-Catholic sentiments. And so the tradition of Pope Night continued throughout the United States for some time, but usually in conjunction with Election Day or Halloween. The November 5th Gunpowder Plot was soon forgotten (At least until the release of the movie V for Vendetta in 2005). Some people think that after our independence from England, the traditional Guy Fawkes Day or Pope Night bonfires and fireworks morphed into our modern Fourth of July celebrations. Most historians would probably agree. This is great. I never knew about Pope Night or Pope's Day. I've remembered November 5th for a long time, because it is my husband's birthday. When his birthday arrives, we always remind our friends about Guy Fawkes Day and the Gunpowder Plot. Now we can tell them about Pope Night as well. Thanks for all this interesting history! I knew about Guy Fawkes from my Grandmother, who grew up in England. She always compared Guy Fawkes to Halloween. But when I learned the history of who Fawkes was and why he tried to blow up Parliment, all the rest of the story of Pope Night came together. Heather, I happened to be in a pub in York, England, where Guy Fawkes and his cohorts supposedly met and made their plans. It's said to be haunted to this day, with chairs mysteriously pulled around the fireplace in the middle of the night. I've never heard of Pope Night, though. Very interesting! Heather, thanks for this excellent summary and overview. I didn't know about Pope's Day - very interesting! Colonial America was certainly very tumultuous.